Photo looks like they had to cut the roof off. A barrister has told how he pulled the Duke of Edinburgh from the wreckage of his Land Rover as he shouted 'My legs!' after crashing into a Kia carrying two women and a baby. Roy Warne said Prince Philip, 93, told police he had been 'dazzled by the sun' at a T-junction before the collision near his Sandringham Estate in Norfolk. The 75-year-old, who was driving home with his wife Victoria, 72, was first on the scene of the accident and helped free the 'conscious' but 'very shocked and shaken' royal from the car as it lay on its side. The Queen is by his side following the collision which happened just after 3pm when he pulled out of a driveway onto the A149 in Babingley, Norfolk which leads to the royal grounds. 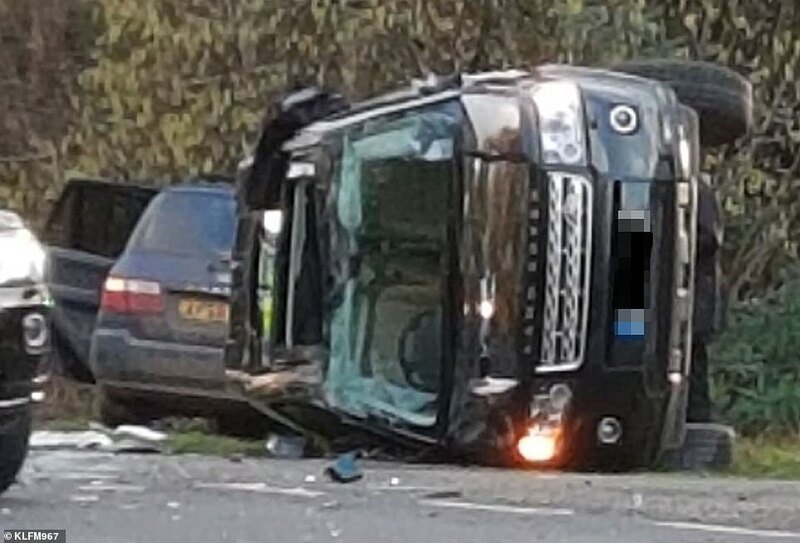 Images have emerged of a black Land Rover Freelander 2 - a 4x4 with a five star NCAP safety rating - having rolled on its side following the crash where he was 't-boned' by a black Kia people carrier. At least five police cars and two ambulances rushed to the scene where two women inside the Kia were treated in hospital, one for a suspected broken arm, the other for an injured knee. The tenth-month-old baby was completedly unharmed. Philip and the female driver were breathalysed at the scene and both gave negative readings. The accident happened on a stretch of the single carriageway road which has a 60mph limit and is a notorious accident spot. He's far enough into The Bonus to be stripped of his driving privileges. The Duke is 97 not 93 as the DM stated early on. 1. He's far enough into The Bonus to be stripped of his driving privileges. He and I quit smoking together. 3. The Duke is 97 not 93 as the DM stated early on.